Usually I don’t have much patience with 8-bit nostalgia, but man-oh-man, I’m in love with the PocketCHIP handheld computer, and the PICO-8 fantasy console. The PICO-8 is 8-bit nostalgia done right. It’s not about reminiscing about how good particular games were. It’s about recreating the whole 8-bit experience. Well, not the whole experience. It eliminates all of the frustrating bits! Nobody is honestly nostalgic about loading games from tapes, for example. What it does recreate is the experience of having a simple computer that you can dive in and make it do what you like, but without feeling like you’re being coddled by a educational software for babies. You can play games on it, you can make games on it very easily, or you can play games, then edit them, and then play them again. You could run the PICO-8 emulator on your desktop computer, or your Raspberry Pi, but somehow it feels so much more fun to have special hardware for it. 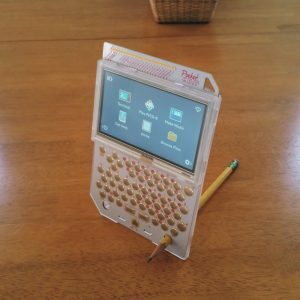 This is the PocketCHIP computer. 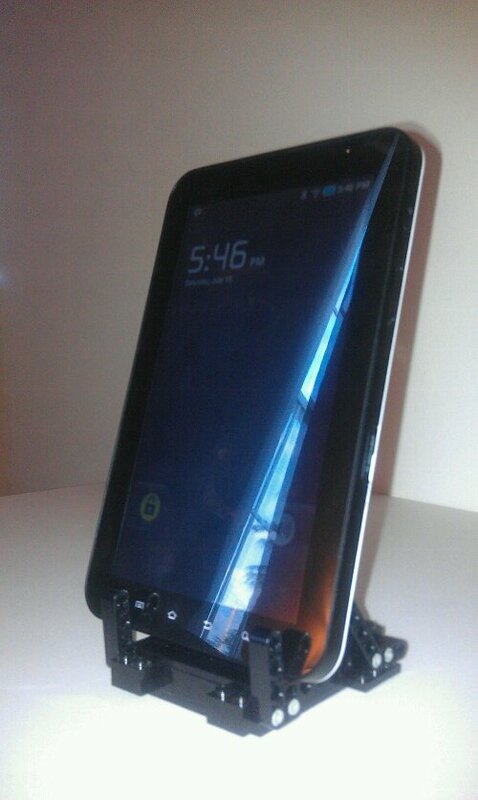 It’s a passable enough pocket linux system. The software is perfectly hackable, and it’s got solder pads accross the top for hardware hacking. Best of all, it comes pre-loaded with PICO-8, and that’s where it really shines. Ok, the keyboard is a bit wonky, but for serious typing you can plug in a USB keyboard, and let’s be honest : A wonky keyboard is a legitimate part of the 8-bit experience! So I made a game. 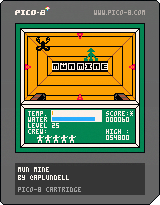 I decided that the first game I should make for this system would be an homage to the earliest game I have strong memories of playing : “Moon Mine“. Published in 1983, “Moon Mine” was available only on the TI-99/4a, Which means that nobody has ever heard of it. I had it though, and it was a blast. For years this was my favorite game. So here’s my remake. Made from memory and by closely examining the old game manual I found in the basement. I realized I didn’t have a single place where I show off all the stuff I’ve done professionally, so I figured I’d throw this page together. Space Miner Wars (known internally as “Sminc” after its original title ‘Space Miner Incorporated’.) is a follow-up to the classic iOS game “Space Miner”. It combines base-building mechanics with asteroids-style gameplay while maintaining the series’s trademark goofy sense of humor. For advanced players the main attraction is attacking other player’s bases, which is done while personally piloting you own ship, not by commanding units. If the game has a flaw it’s that the session times are a touch on the long side in an era when players are looking for quicker games (like Supercell’s “Clash Royal”), but I will still enthusiastically recommend it for the game for anyone who likes both action and base-building. Virtual Realty spray painting! I was Lead Programmer on this project up until it’s first released version. I notice a bunch of features have been added since then, but the basics are all stuff I worked on. This thing is really fun to use. This has got to be VRSim’s most popular product. I was Lead Programmer through the whole development process. This is a really cool educational product, and it was great fun to make. Shown in this video is the “mobile” version, which has a smaller case and a touch-screen, but is otherwise basically the same as the classic version. The Predecessor to the VRTex. It looks so primitive now, but was state of the art virtual reality back in 2007. I can’t find any video of the earler work we did at VRSim, but perhaps that’s for the best. We did all kinds of custome simulations for Sikorsky Aircraft, Bell Helecopter, Pratt&Whitney, and I don’t remember who else, but I suspect it hasn’t aged all that well and probably looks very primitive today, just a decade later. This looks a bit rough now, but it was pretty cool for its day. I’m still proud of it. Conspiracy theorists like to zoom in on jpeg artifacts and declare that they’ve found “proof” of an official cover-up of life on Mars. Those people are working too hard. 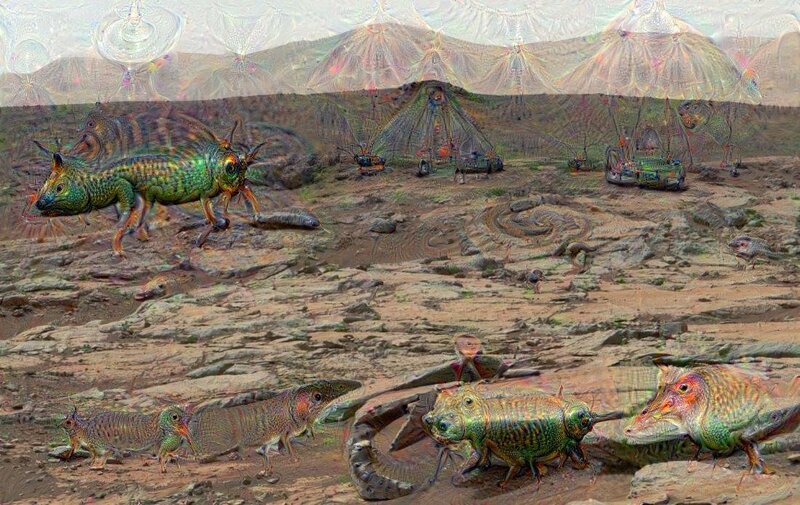 You can find much more compelling proofs by running the official photographs through the Google Deep Dream software. 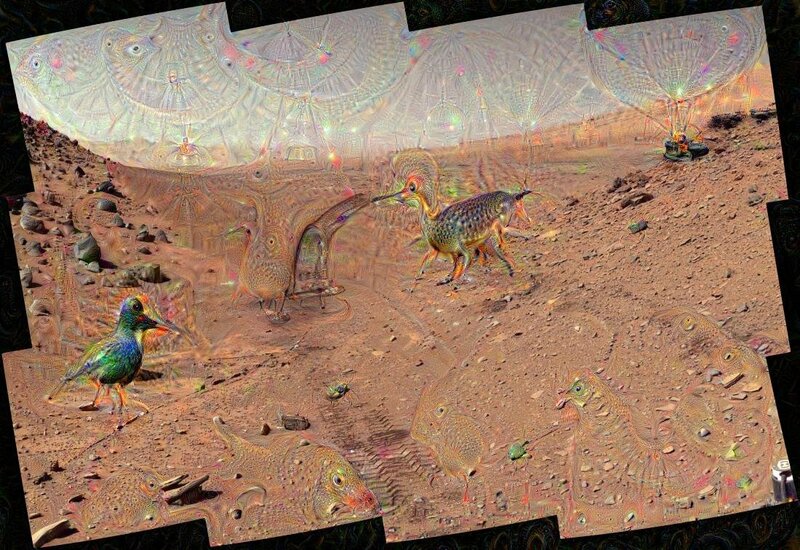 You remember Deep Dream, right? It was really popular a month and a half ago! 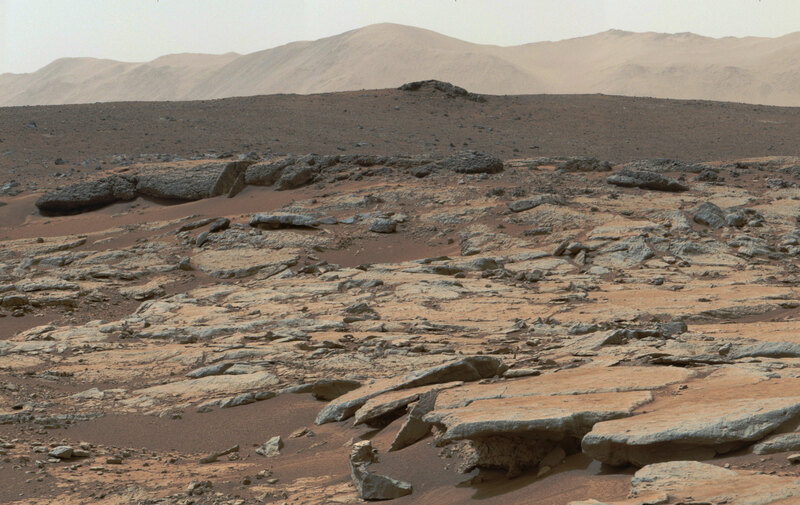 These images from Mars Curiosity totally prove the existence of life on Mars. Weird life. Check out those bird-things. The one in the back has dog legs! NASA needs to stage a mission to bring some of those back. They’d make amazing pets. Even poorly stitched, this panorama proves that Curiosity is basically surrounded by invisible monsters. SOLVED : Why does YouTube make my monitor flicker? 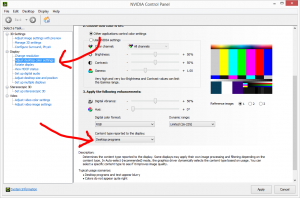 Ever since I got my new computer with its blazing fast NVIDIA graphics card, and hooked it up to my home theater projector, I’ve been noticing one really aggravating problem. In fact, it does this every time it changes video quality to compensate for bandwidth hickups. So halfway through a TV Show, it might suddenly decide to turn my monitor black for two seconds! ARGG! Googling suggested that I should turn off all hardware acceleration in the video drivers. This helped a little, but the downside was, all my hardware acceleration was turned off. I want that turned on! Acceleration makes things go faster! Today, I finally found the solution. Change “Content Type Reported to the Display” to anything other than “auto-select”. Everyone’s familiar with Pastor Fred Phelps’ favorite bigoted, yet catchy, slogan to scrawl across a crudely made picket sign. A few years ago I purchased a very similar slogan as a domain on the theory that God might also hate Bags. My domain had all the catchiness of Fred Phelp’s original slogan, without any of the bigotry or stupidity. Well, ok. There might still have been some stupidity, but it was intended ironically. Really. Truly, it was one of the greatest domain names of all times, and could have easily made me a dot-com millionaire. Sadly, I never did use it to become a dot-com millionaire, so when I was approached by an outfit called “Revel & Riot” who offered to buy the domain from me, you can bet I jumped at the chance to cash in! Revel & Riot manufactures, or at least sells, LGBT pride T-shirts and other assorted merch, so you can see why they’d be interested in such a catchy domain. I now notice that the domain went online a while ago with a page featuring a number of different actual bags bearing that slogan, apparently so you can taunt the almighty by not only carrying a bag, but also acknowledging that you know he hates them. I recommend that everyone go buy one of their bags right now so that they feel like the domain was worth the extravagant sum I suckered them into forking over. How much money did they wind up paying me for this extraordinary domain name? I don’t like to say, but if you see me going by on a brand new luxury yacht, well, then I recommend getting out of my way, because I do not actually know how to sail a yacht. Pieced this together from a few images on Wikipedia. These are all that’s left of the Seven Wonders of the World. The top one is obviously the Great Pyramid at Giza, in rough shape, but still a wonder. Next is the Temple of Artemis at Ephesus. All that’s left is a few bits of the columns that someone has stacked into a single column of miss-matched pieces. You’d never guess that the largest temple in the known world once stood here. The bottom one is the best photograph I could find of the Lighthouse at Alexandria. Most of the lighthouse fell into the ocean. Supposedly large chunks of it still exist, and a I’m a little disappointed that I can’t find better photographs, but perhaps the water isn’t clear enough for a wide angle shot. I’m not sure what motivated me to look this up, but I find it absolutely fascinating that, of the seven most impressive structures known to the ancient Greeks, all that remains is a badly weathered pyramid, and three piles of rubble. Saw a sign at the drug store today that said “What’s New In Beauty?“, and I thought “Wow, what a deep question!”. ‘Beauty’ is generally thought of as an unchanging and eternal ideal that all styles of art strives to achieve. In that case, would there ever be anything truly “new in beauty”? Or would there simply be new art that strives to achieve beauty? But perhaps that’s not the case, what if ‘beauty’ is only a rationalization we use to explain why art appeals to our simple brains? In that case, isn’t beauty defined by our art, and anything “new in art” could also be said to be “new in beauty”? Anyway, Turns out they were talking about their makeup department. Classic Hipster PDA. Binder clip and all. In 2004, back when PDAs like the PalmV were still popular, (Smart phones were still just for super-nerds.) a blogger named Merlin Mann got tired of his PDA, and decided he needed something simpler and easier to use. So he took a bunch of index cards, held them together with a binder-clip, and stuck them in his pocket. He called this the “Hipster PDA” because it was retro, and it replaced his PalmV. Now, I’m not sure if he was being serious, or just making a point, but the idea took off. Soon, people all across the world were extolling the virtues of this return to simplicity. Some people, craving the order and organization imposed by software, started designing templates that could be printed onto the cards to make this mass of index cards behave like it’s electronic forbears. There was only one problem : The Hipster PDA is pretty terrible to use. The binder clip is horrible. Absolutely not the right tool for the job. It’s a pain to open, it’s got those little handles that have to be flipped up and then flipped back down. It’s difficult to write on a pile of loose cards. Unlike a solid PDA which makes it’s own writing surface, the hipster PDA pretty much has to be put down on a table if you’re going to do anything other than horrible scribbles. My first step along the road to reinventing the Hipster PDA, was to dispense with that stupid clip. 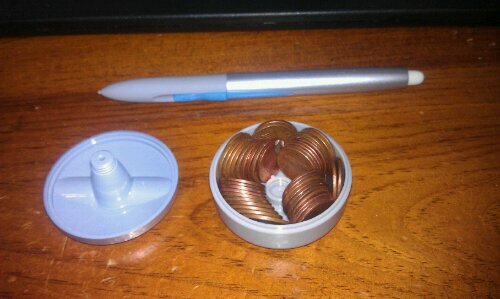 Instead I used a small “bullet” style miniature pen with a rather large clip that could hold a couple dozen cards itself. This was better, because it got rid of that goofy clip so it solved #1, but it still didn’t do anything for #2. Based on a design I scribbled down on an index card, I decided to build something better. 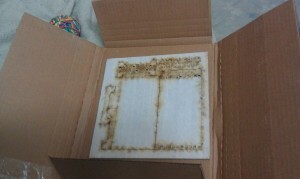 As luck would have it I’d been itching to try out the Ponoko laser-cutting service. If you’re not familiar with Ponoko, the basic idea is that you send them a design, and they will laser-cut it out of your choice of a wide variety of materials and mail it to you. Hold a bunch of cards with no clip. 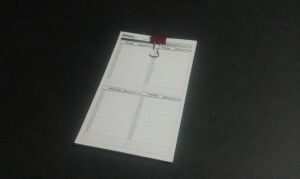 Provide a soldid back-board so I can write without finding a table-top. 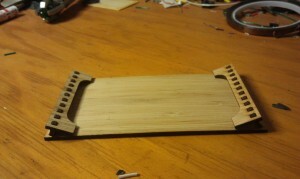 The “Cool” way to design laser-cut gadgets is to design them so that they slot together with no glue at all. So that’s what I did. 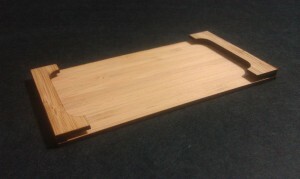 As you can see, I’ve got a back-board with a row of holes, a pair of top pieces with matching holes, and a pair of connecting pieces with a zillion pegs on them. After that, since I had some space left over. I made another one that had no holes, and could be simply held together with glue. I’m glad I did. More on that later. 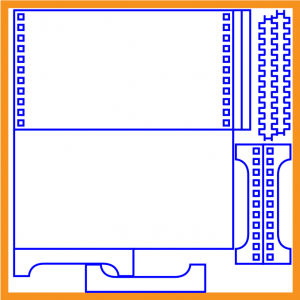 One interesting aspect of laser-cutting services, is that in addition to the material cost, they charge you for the time it takes to cut the material. So it becomes a game or puzzle to draw all your pieces on the board with as few lines as possible. Notice how the spacers for the glue version is right up against the backboard for the slotted version. That’s not an accident, and I didn’t do it to be confusing. I laid it out like that so that I could share that edge. Looking back on it now, I see a few places where I could have eliminated a few more lines, but I think I did a pretty job of optimizing it. I was pretty excited about my first attempt at making something with laser-cut parts, so it seemed like it took forever to arrive in the mail. Actually it took about a week. As you can see the sheets come with easily-removed sticky paper over the entire surface. I think this is done to create a consistant surface for the lasers to work on. Especially if you’d chosen a clear or reflective material. In an instant I was at my work-bench poping pieces out like I was making a plastic model! 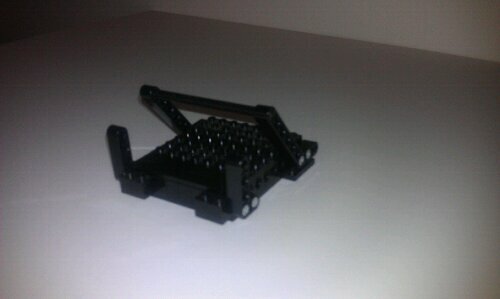 However, I hit a slight snag with the slotted-together version of my new invention. Apparently … somehow … I miscalculated the size the holes should be. They’re about a third bigger than they should be. I must have had the wrong number for material thickness. Luckily, I had also made the one that glues together. Previously I had thought of it as just something to fill up the unused space on the board, but now I was glad I’d done it. Basically it was a simple stacking construction. On either end of the base plate the little “space sticks” were glued, and then on top of them the no-hole overhangs were glued. Success! 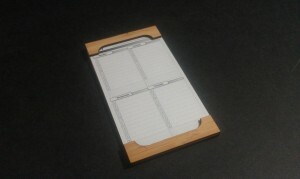 I now have a lovely bamboo card-holder that holds my index cards. It works quite well, and it fulfills my requirements. Those overhangs are not clips; they’re just lips that hold the cards by friction. It allows me to write easily without putting the cards down on a surface. And it’s quite comfortable in my pocket. The nice thing about bamboo is that it’s very light, despite having a good amount of strength. My original idea had a place to clip a SpacePen, this concept was scrapped, but I think a tiny loop of cloth or ribbon along the top would be sufficient. Perhaps it would still work fine with a smaller over-hang. Because the cards are held in place by friction, there’s a minimum number of cards that must be carried. And because the gap between the back and the overhangs is pretty small, there’s also a maximum number of cards that can be carried. The sweet-spot seems to be about a dozen cards, which may be too few for some people. Bamboo is cool and very elegant, but I wonder if this wouldn’t also be cool in acrylic. Has anyone else made something along these lines? I couldn’t find anything on Google, but I’d love to hear about it. If anyone want’s to recreate this, my SVG file is here, But remember to adjust the holes to match the width of the material you use!